No matter where you live, there’s a lot of division in the world today. One area of division that is a favorite amongst politicians is the divide between rich and poor. Some politicians make it their theme to demonize the wealthy. Likewise, they also make it a point to convince people that the reason they are poor is because some wealthy person took advantage of them. Some Christian ministers teach that if you’re not wealthy, then you’re just not really in tune with God or else He would be blessing you with money. Of course, the same ministers are more than happy to send you their book how to be wealthy through God for a donation of $50.00 or more. 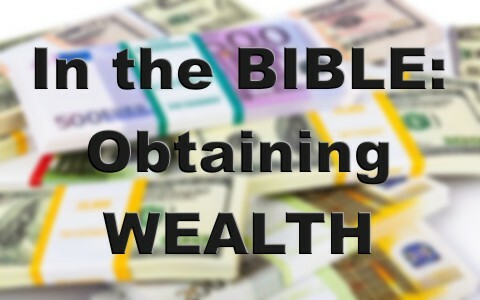 With all of this nonsense, it is important to understand what does the Bible say about obtaining wealth? Therefore a short Christian study on wealth makes sense. Wealth is the eternal blessings from God that result in prosperity and external happiness. Since the word wealth means different things to different people, a look at the historic definition of wealth is in order. Webster’s 1828 Dictionary defines wealth as (1): “WEALTH, n. 1. Prosperity; external happiness. 2. Riches; large possessions of money, goods, or land; that abundance of worldly estate which exceeds the estate of the greater part of the community; affluence; opulence.” The word wealth has its origin in the Middle English word welthe, which is the same word we use for a well or weal, and gives us the idea having well-being or well health (2). This well-being or well health creates external happiness or a glow as some would describe it. This is where the word prosperous comes in. You prosper when you obtain something that is good or desirable (2). Noah Webster was known for often listing Bible verses that use the referenced word. In the case of prosperity, he quoted Proverbs 1: “The prosperity of fools shall destroy them.” Webster made reference to this verse because of the larger passage in Proverbs 1:24-33 that contains these words. The passage describes those who do not seek after God. That their prosperity will lead to their demise. This shows us that prosperity does not always come from God, but only prosperity from God comes with the blessing of inner peace. These definitions demonstrate that true wealth is not tied to money or riches. Historically, a person’s health often demonstrated their wealth. Being sickly often was thought of as a consequence of being poor. While being able to live with your needs being provided and seeing a doctor as needed often does depend on your wealth, the word wealth originally had nothing to do with being rich. How does the Bible define wealth? Let no man seek his own, but every man another’s wealth (1 Corinthians 10:24). Let him that stole steal no more: but rather let him labour, working with his hands the thing which is good, that he may have to give to him that needeth (Ephesians 4:28). In Matthew 6:19-21, we learn to set our sights on treasure in heaven, which has eternal value. In doing so, it reveals where our heart is in our relationship with Christ. This in turn is reflected in the external joy of our attitude about our wealth and concern for the wealth of others. Is there an example in the Bible of someone who demonstrated their eternal wealth? Yes there is. For example, in 1 Kings 3:1-15, the LORD appeared to King Solomon in a dream. He asked Solomon what he wanted God to give him. Solomon spoke how God had shown mercy to his father David. However, since Solomon was now the King, he desired that God would give him the wisdom and understanding to discern between good and bad so that he could be a good judge over God’s people. Solomon said that he was only a child and needed God’s blessing in this matter. God fulfilled Solomon’s request, but He also gave Solomon something he did not ask for. He gave him riches, honor, and long life. Solomon’s showed his love for God’s blessing by making a feast for all his servants. Wealth is the eternal blessings from God that result in prosperity and external happiness. Prosperity does not always result in earthly things or riches. Instead, it produces a joy that reflects an inner wealth of a good relationship with God. It also results in a desire to be a blessing or use what we have to bless others so that they too can experience the wealth of God that is eternal. Solomon demonstrated his eternal wealth by asking God to make him a good judge over God’s people so that he would honor God and God’s people. Here is another article that might interest you: Does God Want Us to be Rich? Previous post: What Did Shaking The Dust Off Your Feet Mean In The Bible? Next post: Why Are Jesus and Satan Referred To As The Morning Star In The Bible?